Hi everyone! I hope you are having a wonderful sunday! The summer is gone. I feel relaxed and ready to welcome the new season. The autumn is coming with a small melancholy and a romantic mood for all of us. It won't be long before we can see the beautiful autumn foliage. It's my favourite time of year! 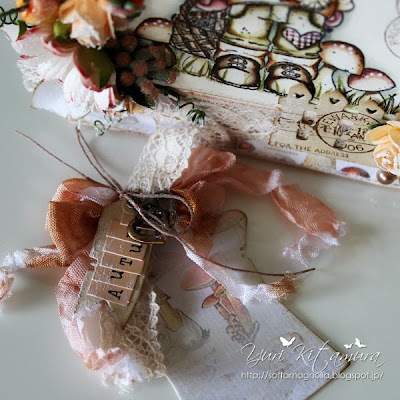 So today, I am here with a autumnal card I made for this month's Colour Challenge on the Ribbon Girl Blog. Our colour theme this month is 'Orange/Peach'. Here is a lovely pic to inspire you all. Aren’t these colors just yummy? I love this color combination. For my card, I have used 'Standing Fall Tilda', stamped and masked her and then I stamped the 'Mushrooms in a Row' on the bottom of the image using Archival Ink Black. They're both from Magnolia Halloween & Autumn Collection 2008. I have coloured with Distress re-inkers as always. The gorgeous embellies are available at Ribbon Girl Online Shop: Small Beaded Berries Peach, Beaded Ivory Gypsophalia, Daisy Pale Peach, Peach/Autumn Gold 20mm Open Rose, Carnation Peach, Cheesecloth and White Seam Binding(which I coloured), 17mm 'Faye' Ivory Vintage Style Lace, Light Brown Hemp Twine. (links at the end of my post). 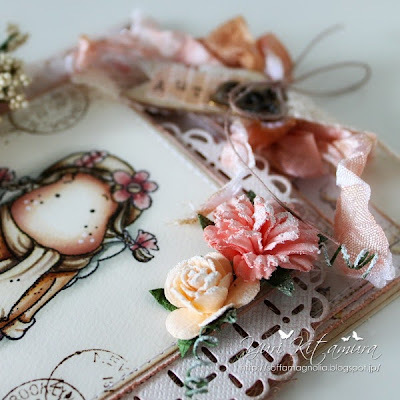 Also, I coloured Cheesecloth and White Seam Binding with Distress Inks Vintage Photo/ Tattered Rose) and painted flowers with Snow Tex. Tiny apples from my stash. I used Magnolia Doohickye dies - Lace Coster, Scalloped Tag, Tea Label Tags, Lovely Fence and Summer Foliage(leaf). The beautiful papers are also from Magnolia. I hope you like my card and it inspired you to joins us in our challenge. 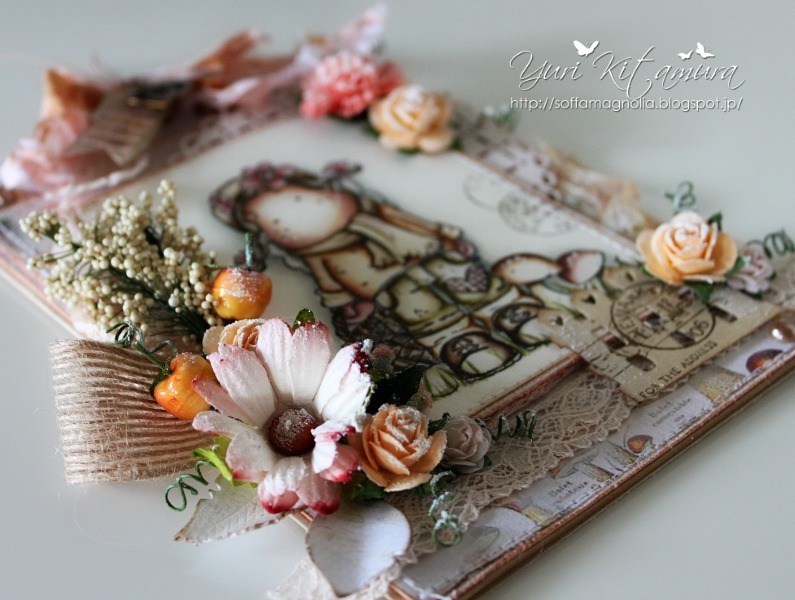 Please pop over to the Ribbon Girl Blog to see the rest of the DT's fabulous creations and there are 2 fabulous prizes for grabs, so be sure to check the blog for all the details! Thank you so much for stopping by my blog today and for your lovely comments. BUA! THIS IS the explain of word BEAUTIFUL! Really really pretty; fantastic colours. Elena F.
wow ! It is beautifull !! Thanks so much for joining us at Tilda's Town Challenge. また、次回も楽しみにしていますね〜♪　Thanks always !!! (^o^)/"""
Ohhhh so sweet! I love everything about it. Your colouring is amazing. This is what I call a perfect card! 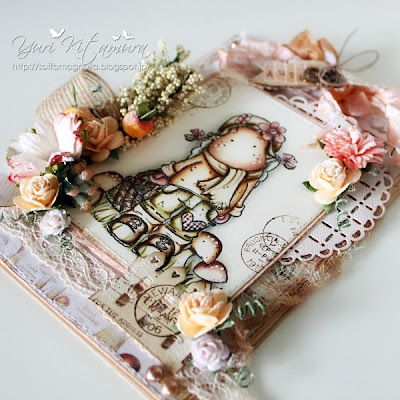 You don't have to use a stamp from the newest collection to make a card as beautiful as this one. Amazing Yuri! Gorgeous as always, Yuri! Thanks for joining us at Stamp and Create with Magnolia! Beautiful project! 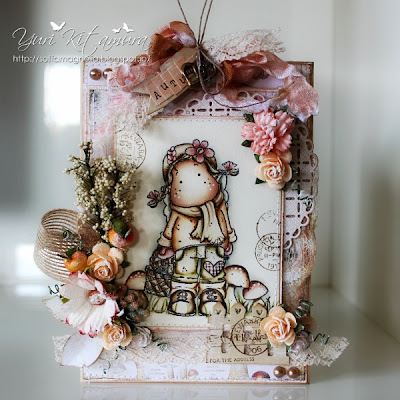 Thank you for playing along with the Stamp and Create with Magnolia Challenge. We will have another fun one for your tomorrow. We hope you will play along again soon!